Published on June 9, 2011 by Martyn. Be the first to comment! 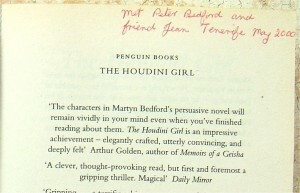 A poignant curiosity has come my way courtesy of Robin Lee, from Biggar, in Scotland, who bought a copy of THE HOUDINI GIRL from a car-boot sale. Inside, he found an inscription from my dad to someone called Ina, who had herself noted on the prelim page that she’d been given the book by my father and his lady friend, Jean, in Tenerife in 2000. Little could Dad have imagined that, 11 years later, this copy of the book would find its way to a car-boot sale in Scotland. 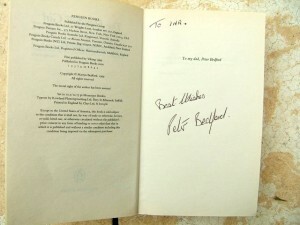 Or that the buyer would be kind enough to contact me via my website and send me photos of the inscribed pages. Dad died in 2006 but even now it’s a wistful moment to come across his signature like this. And particularly distressing to think that he was GIVING MY BLOODY BOOKS AWAY!